Fine jewellery specialist C W Sellors has partnered with Chatsworth House to recreate a spectacular headpiece for an exhibition designed to demonstrate the power of fashion. Here, we find out how the workshop mixed traditional techniques with modern technology to bring an old gem to life. The relationship between C W Sellors and Chatsworth House sketches back over 35 years as the residence’s family were among the first customers to buy Chris Sellors’ early jewellery designs and bespoke pieces. Furthermore, Deborah Cavendish, the then Duchess of Devonshire, opened the company’s new purpose built premises on King Street, Ashbourne in 1989. Given the history and C W Sellors reputation, it was no surprise when Chatsworth approached Chris Sellors to recreate some of the precious jewellery items from the family vaults for their new exhibition ‘House Style — five centuries of fashion at Chatsworth’. C W Sellors are proud sponsors of the House’s new exhibition, which has been designed to demonstrate the power of fashion and bring to life the captivating individuals from the Cavendish family, including Bass of Hardwick, one of the most powerful women of the 16th century; the 18th century ‘Empress of Fashion’ Georgiana, Duchess of Devonshire; and Adele Astaire, the sister and dance partner of Fred Astaire. Deborah Devonshire and Nancy Mitford, two of the Mitford sisters; model Stella Tennant and John F Kennedy’s sister ‘Kick’ Kennedy will also be central to the show. One of the main features of the event, taking place at Chatworth from March 25 to October 22, is the striking costume which has been created to represent an outfit Louisa, Duchess of Devonshire, wore during a lavish ball held at Devonshire House in 1987 to celebrate Queen Victoria’s Diamond Jubilee. C W Sellors were given the challenge of recreating the headpiece she wore, which consisted of pearls, coloured gemstones and some very intricate metal work settings. As the original headdress no longer exists the workshop at C W Sellors set about recreating the piece from a single sepia photo, from sketching out the initial designs, through to sourcing all gemstones and pearls and handcrafting every piece of the detailed silver frame. The headpiece proved to be no ordinary jewellery commission for the team. It required cutting and setting stones from just a few millimetres in size, to larger unique pieces, crafted to fit into the overall design. C W Sellors only had an old photo to work from. In total the project took C W Sellors 12 months to complete. While the headdress is considerably larger than many commissions the workshop regularly undertakes, the piece called on the team to employ traditional jewellery making techniques and mix the old with the new. In the case of the metal work on the headdress the tools C W Sellors used were not too different from the ones which would have been used on the original piece. The style and layout of the jewellery benches in the workshop and the hand tools would have been very familiar to the first craftsmen, although for soldering workshops now generate hydrogen to burn instead of using normal gas so it burns hotter and is safer and easier to use. With the stonework C W Sellors had the great advantage of using modern diamond coated lapidary cutting, grinding and polishing wheels on variable speed electric machines to make the shaping and cutting of the stones a lot quicker and much more straightforward than it would have been in the 1890s. “Using modern high speed cutting machines with their continuous water-feed and superb dust extraction (not to underplay the importance of something as simple as nice bright electric lighting) will have made the actual making of the headdress more pleasant and much safer than it would have been when the stones were originally cut,” Barker remarks. The team admits it took some painstaking work to re-envisage the design —especially working from just a single sepia photo. Crafted in an elaborate silver frame gilded in gold, the final piece comprises over 450 stones: 164 simulated diamonds, 33 amethysts, 118 peridots, 119 pearls and 19 hand crafted Derbyshire Blue Johns. 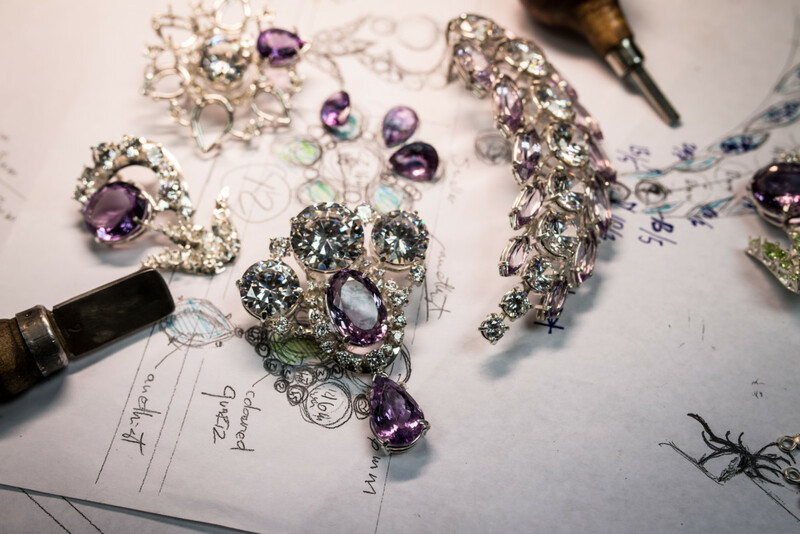 The stones were sourced from all over the world, including pearls from the Far East and amethyst and peridot from Brazil. Given C W Sellors’ stated passion for British gemstones, it was a small wonder to find Derbyshire Blue John appearing regularly in the Chatsworth House style jewellery collection. “In going through this whole process of recreating the headdress and studying the intricacy of the design, it was both enlightening and humbling to see the level of craftsmanship and skill that it would have taken to make which sadly fewer and fewer UK manufacturing workshops can display nowadays,” shares C W Sellors managing director, Chris Sellors. “We were grateful to have had the opportunity to put our skills to the test and prove that our level of expertise was equal to the skills of the jewellers of the late 19th Century. Through this commission we demonstrated that we can create almost anything in jewellery that is asked of us,” Sellors adds. Alongside the headpiece, the C W Sellors team have been busy fashioning two additional diamond tiaras and a special retail jewellery collection inspired by the Devonshire family. These can be viewed first-hand when the exhibition opens at Chatsworth House in March 2017. The retail range will be officially launched to the trade at International Jewellery London in September.